The Sandia Mountains are a mountain rangelocated in Bernalillo and Sandoval counties, immediately to the east of the city of Albuquerque in New Mexico in the southwestern United States. The range is largely within the Cibola National Forest, and part of the range is protected as theSandia Mountain Wilderness. 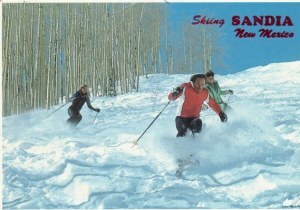 It is home to the Sandia Peak Ski Area. Its highest point is Sandia Crest, 10,678 feet (3,255 m).